So who says a 5 foot 1, pudgy redhead can’t go to Japan to become the next pop star singing in Japanese? Well, most people actually. Reactions to my venture were predominantly full of laughter, surprise and doubt. It didn’t help that I was approximately 20 pounds overweight as well. I had studied Japanese in University and lived in Japan for about a year before my adventure began. While in Tokyo, I fell in love with Japanese culture and Pop Music. After leaving Japan and coming home, while talking with a friend one day, we discussed my love for karaoke and singing in Japanese. I decided that I would try the impossible and go after something I really wanted. Not only did I have to start with basic singing lessons, I also had to engage in a serious weight loss program. This is where my physical transformation began. During a one-year time frame, I cycled, walked, jogged, and taebo-ed; but this was different from any other previous attempt at shedding pounds. I was engulfed in my dream, my goal, my vision. This vision made me stronger and encouraged me to push harder. Within one year, I lost an amazing 25 to 30 pounds. Most importantly, I did it properly, with exercise and healthy eating. My physical transformation reminded me that my possibilities were endless. Suddenly I was a healthy, cute, and more confident red-head (with trendy blonde streaks!) ready to introduce myself to the world. A friend who was working in Ireland got his media company interested in my venture. I was flown to Ireland to record music and to film a video. It was a dream come true. I imagined me wearing earphones in a state-of-the-art studio, wearing cool clothes and busting out tunes. I landed in Dublin and quickly realized my dream was mostly convoluted. I found myself in a studio that was actually a transformed guest room in a house, the size of a port-a-potty. My Japanese lyrics were put together to music that was written by a friend. The recording process was not glamorous by any means and I struggled with simple tunes. 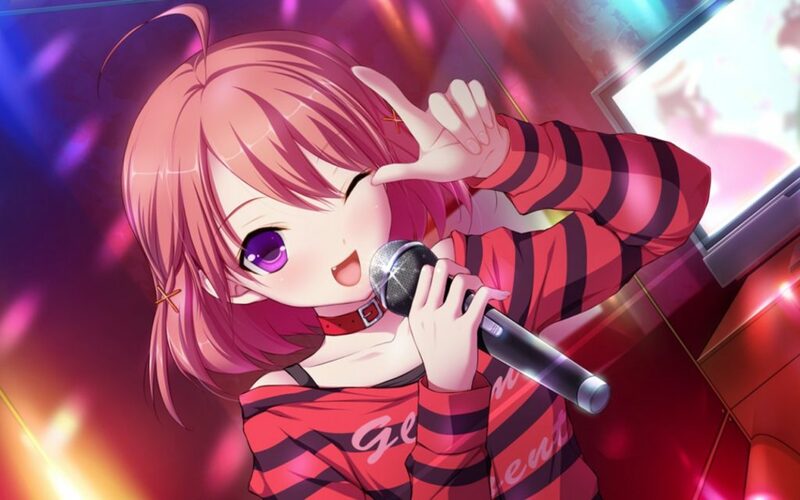 In fact the second demo song was to be a beautiful ballad, but in the wee hours of the night, realizing my voice wasn’t meant for love songs, it turned into a rap song! Although embarrassed, I managed to push past it, still in shock over the recording studio. When it came to video time, there were no make-up artists, wardrobe consultants, or background dancers. Instead, I went to the nearest boutique and bought last minute attire with the full intention of returning it after shooting. It was a tacky, light blue, fluffy full-length coat, that cost a pretty penny, and it won my heart over! Once again, the experience was long and drawn out, taken with a camcorder that looked more like one that a family uses on vacation. I left Ireland feeling major disappointment and hopelessness. I also left without any proof of my performance in hand. I was told that the demo CD and promo video would be completed in a short time and that they would market it in Japan. I had no choice but to fall back into 9-5 office life. Here I was, a potential future pop star in Japan, screening phone calls for a school director. For six months I waited patiently, working out, trying to stay hopeful. I was then told that the company did not have the resources to continue the promotion. My world was crushed. Fortunately it only took a couple of days of moping to realize that I wasn’t finished. There was no way that I was going down this way. So, I got a hold of my demo and then had a CD cover created from cheesy pop pictures I had taken. Next thing I knew, I quit my job and was boarding a plane to Japan. Crazy? Yes, it was. Considering I had little savings, and didn’t have a well thought-out strategic plan, it was absolutely irrational and unheard of, but . . . incredibly gutsy. I knew my mind and heart would not rest until I gave it a true attempt in my own mind. Japan was a miss-match of adventures; I went from singing in a house with a Hawaiian band, to auditioning for a rap group. This was met with days of eating on a budget of 500 yen, and teaching ESL to a rambunctious group of kids in cram school. Only a couple of years from the big 30, I realized that I would need years of dedication, more extremely hard work, and luck. As my resources dwindled and the paranoia that my voice sounded like a really poor contestant on an Idol show, I decided to put my pop star life to rest. I was surprisingly relieved with this decision, but I needed closure. Herein came the video. I was fortunate enough to meet a fabulous writer and director along my travels who latched onto my idea with delight and amazement. He suggested we put a music video together, which absolutely thrilled me. Well, this video also wasn’t as glamorous as I had imagined, but it did put some closure to my quest. On a budget, we managed to pull things together nicely: I borrowed some clothes, convinced break-dancers to be my background dancers, and let the backdrop of Japan shine brilliantly. I couldn’t have asked for more. The video did just as I had hoped, brought some amount of closure to my adventure. I returned to Canada broke, but with a full sense of pride. Although my dream hadn’t played out exactly as I imagined, it was an experience that changed my life. When I watch my video now, it seems surreal. It is a constant reminder that I can be or do anything in this life. Whatever is next, is going to be just as jaw-dropping. Kim Cooper lives and works in Toronto Canada. She works in the advertising industry but her love for writing and film keeps her busy in her spare time. She loves to be inspired and hopes to motivate others to find the best in themselves.